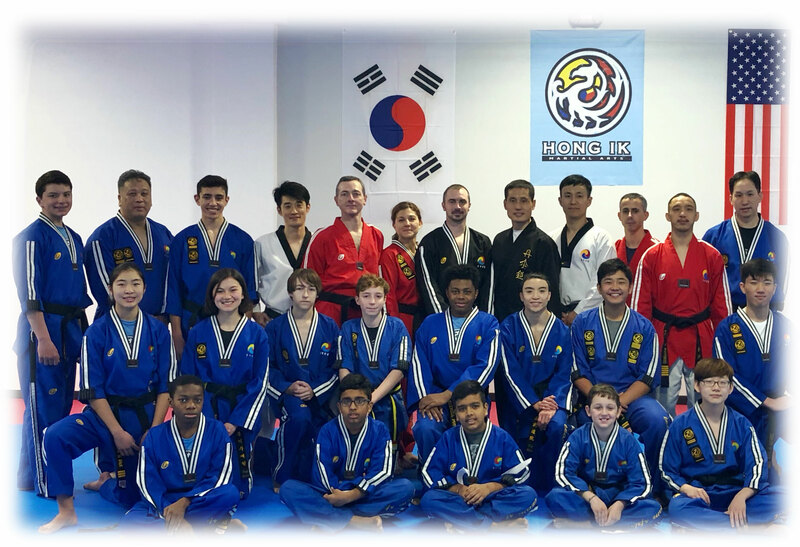 On January 27th, Hong Ik Martial Arts Leaders gathered together for HST Class led by Grandmaster Yoo at the brand new Hong Ik Martial Arts Bronxville location. Class began with our standard warm-ups mixing in various standing exercises and floor stretches. Students then moved into martial movements themed around Dan Jun awareness and stabilization. Different balance postures were put together with punching techniques from forward stance. Flow from one movement to the next was emphasized. Following this, Hyunsas and Susas partnered up with one another to do the following: – crescent kick to the palms – simultaneous front snap kicks – 2 roundhouse kicks combination – partner back kicks – synapse activation training. The first two exercises were done with the intention to remain light on one’s feet while transitioning in between kicks. The second two were intended to improve the individual’s reaction time against kicks. The final training utilized basic blocks and elbow strikes in a unique format to awaken the brain in new ways. The gathering then went on to form several single file lines to work the round house kick and spinning round house kick on the focus pads. Grand Master Yoo then had the leadership group partner up once more to break down the back hook kick. One person executed the kick in 4 steps while the partner helped with balance through those steps. Specifically the angle to begin the kick with and finish position was emphasized. Hapkido wristlock practice was next. A new technique was shown to the class and then were broken into 5 different groups. One group for each Master present: Kim, Myungduk, Shinmin, Jiseon, Chunshim. Master Oh was welcoming and greeting both newcomers and students from the other 4 locations who came to watch. After 10 minutes of separated practice, teams of 2 each showed their understanding of what was taught The first HST of 2019 concluded with Chuk Gi and Circulation Kigong. It’s important to learn the combative form of martial arts well and get the body strong. But it is also essential to put time in forms of training which make you feel expanded and connected to the universe.